YOU could almost hear the giggles coming from the East Fremantle coaching box. Surely Sharks coach Steve Malaxos would have seen the funny side of it as his players missed set shots, missed when running into open goals, mucked up attempts to get the ball to a player in the best position and then didn’t even want to have shots for goal. They produced 1.8 in the first quarter, 1.7 in the second, 4.7 in the third and 1.4 in the last on the way to 7.26. It turned out they needed to score 7.32. It was a gripping preliminary final. Subiaco lost their best player and captain Kyal Horsley and leading goal scorer Matt Boland before the game and the creative George Hampson also wasn’t there. They needed to be brave and creative and they were. 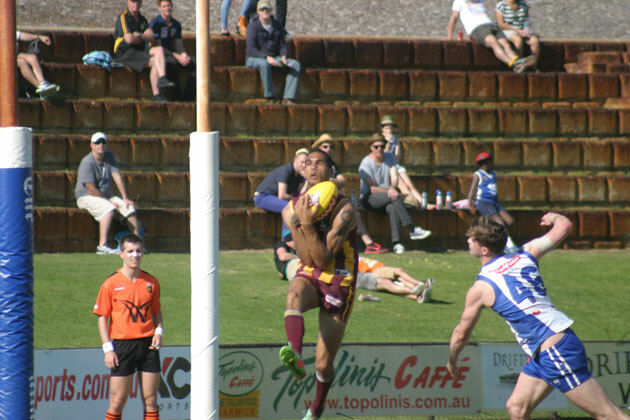 Some of East Fremantle’s football, especially in the third quarter, was exhilarating. Rory O’Brien, Jayden Schofield and Jamie McNamara were running the ball with great effect and, to be fair, the Sharks didn’t have much luck around the goals. A neatly crafted snap shot from 50 by Ryan Lester-Smith hit the base of the post and a running check-side shot from the boundary by Bradd Dalziell was…perfect…but just brushed the post on the way through. 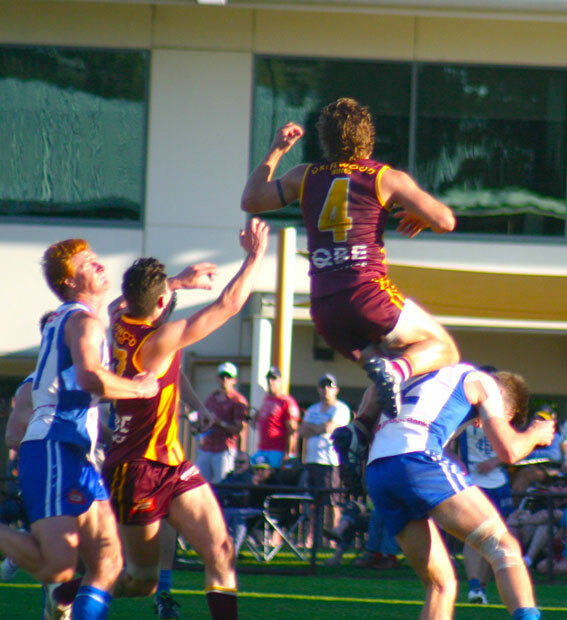 Subi’s Rhys Waters gets up high. He didn’t take the mark but did plenty of good things. The Lions were held together by an extraordinary effort from Wayde Twomey, great work by Andrew McDougall, who is probably in the best form of his career. Dashing work by defender Daniel Leishman helped the cause and no one was more important than Shane Yarran. Staying close to goal for the most part, Yarran’s clever positioning enabled him to kick four goals and that was match-winning contribution. 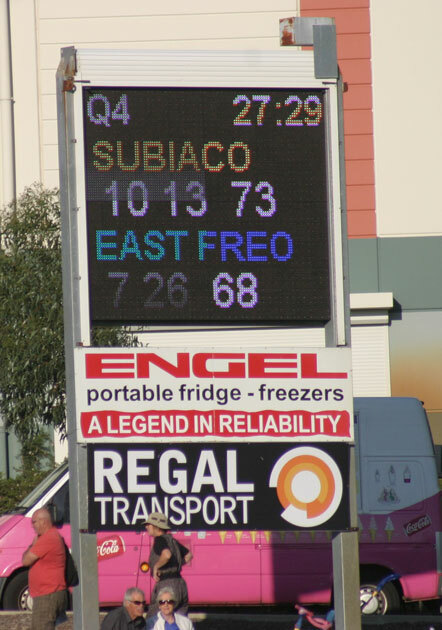 Subiaco will play East Perth in the grand final next Sunday and even some Royals supporters will be barracking for the Lions. 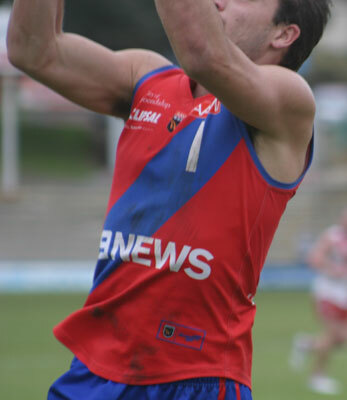 Meanwhile West Perth’s Aaron Black has won the Sandover Medal. He polled 47 votes to win from Luke Blackwell (Claremont) and Shane Nelson (West Perth) with 46, Kyal Horsley (Subiaco) 45, Bradd Dalziell (East Fremantle) 43 and Craig Wulff (East Perth) 35. If East Perth do win the premiership no one will be able to suggest Wulff isn’t deserving. Nearly got him. What Sandover Medal winner Aaron Black almost looks like. This entry was posted in Footy and tagged Aaron Black Sandover Medal, Rhys Waters, Sandover Medal, Shane Yarran, Steve Malaxos, Subiaco Football Club, WAFL. Bookmark the permalink.